Under the headline "Our Heritage Jerusalem" is associated with the city of Jerusalem by cartoonists; Concepts and topics such as human rights, justice, freedom, love, culture, social life, social responsibility, peace, city life are expected to be processed with caricatures in an enriched perspective. Raising awareness of the city of Jerusalem, which has been under Israeli occupation since 1967. To mobilize the international public by drawing attention to the discriminatory policies that the invaded state systematically imposes on 400,000 Muslims living in Jerusalem and the restriction of the freedom of worship that they have carried out in the Masjid al-Aqsa. To bring about the concept of cultural heritage in the context of Jerusalem, the importance of cultural heritage in social life, the awareness of social responsibility in the framework of cultural heritage, the contribution of the cultural heritage of the city of Jerusalem and the importance of our cultural life in the city of Jerusalem. The work submitted to the competition must not have received a prize from any competition before. Association of Mirasımız Special Prize 1.000 TL. Naci el-Ali Special Prize 1.000 TL. Necmettin Erbakan Special Prize 1.000 TL. II. Abdulhamid Han Special Prize 1.000 TL. Selahaddin Eyyubi Special Prize 1.000 TL. 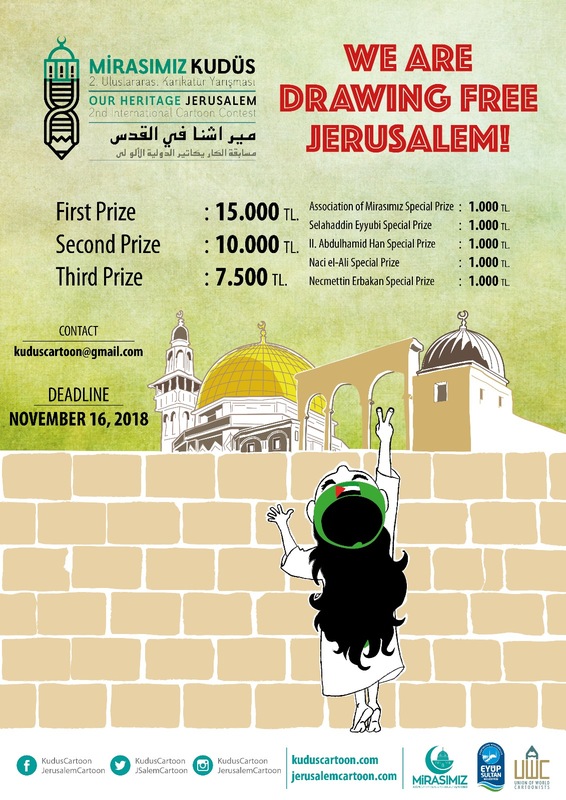 To pre-register for the competition, participants fill out the participation form on the www.kuduscartoon.com , www.jerusalemcartoon.com and www.mirasimiz.org.tr websites. By e-mailing the entry form together with your work or works in jpeg format no more than 200 dpi, not exceeding 5 MB for each work kuduscartoon@gmail.com or jerusalemcartoon@gmail.com. Participants who have pre-registered for the competition must submit the original work(s) with the wet-ink signed participation form, by mail or cargo to MIRASIMIZ DERNEGİ Aksemsettin Mah. Halicilar Cd. No:12 34080 Fatih-Istanbul / TURKEY (If the work is a digital drawing, it is necessary to have a print out with a wet-ink signature on the front side.) Important note: Those who did not posted their original work will be disqualified.